Discover the under water world at the most charming sea you ever experience the red sea which is famous with it’s various sights located in different depths making the diving course unforgettable memory. You will be greeted and assisted at Cairo International Airport and transferred to your hotel by an air-conditioned vehicle. Overnight in Cairo. Enjoy an excursion to the Pyramids of Cheops, Chefren and Mykerinus, as well as the Sphinx and Valley Temple. Then move on to visit the Step Pyramid at Sakkara and the Old Kingdom capital ofMemphis. Overnight in Cairo. Visit the Egyptian Museum to see the treasures of Tutankhamun, among other fascinating pharaonic artifacts. Trip to Islamic Cairo to seethe Citadel of Salah El Din and the Mohamed Ali Alabaster Mosque. Overnight in Cairo. Transfer to Cairo Airport for flight to Sharm El Sheikh, where you will be met and assisted then transferred to Dahab. Surrounded by mountains, this place is an oasis of tranquillity. Check in at your hotel then take the first dive at White House, situated in the bay of Dahab and offers various depths. It has large sandy slopes beside a rocky wall, gorgeously coloured corals, and boasts abundant marine life, such as sleeping parrot fish and Spanish dancers. 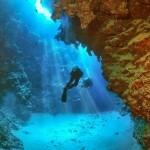 The second dive is at the Canyon, which is a deep wide ravine in the ocean floor. Entering at the fish bowl, which is an enclosed circular cavern full of small gold fish or glassfish, the depths slope from 15 meters to one exit at 30 meters, and another at 52 meters. Overnight in Dahab. Try out The Blue Hole, which is thought to be one of the top world-class dive sites. It is a hole in the reef about 55 meters wide and its max depth is 102 meters. This site offers dives to 30 meters and features a stunning archway, which leads into the bottomless open sea at 54 meters, for advanced divers. The next dive is at Ras Abu Galoum beside sand dunes and high mountains It is ideal for shallow reef dives with its clear blue lagoon and scattered pinnacles. Turtles and ray fish are often spotted here. 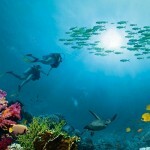 From there go on to Gabr El Bint to enjoy diving among virgin reefs and rich marine life. This site offers wall diving and gentle sandy slopes with coral outcrops. Overnight in Dahab. Enjoy a dive at Lagoona, a site which always has good visibility before checking out and transferring to Sharm El Sheikh. Two dives at Ras Mohamed, where the Gulf of Aqaba meets with the Gulf of Suez. It offers depths of over 1000 meters, and more variety and density of reef species than any other spot in northern Sinai. Overnight in Dahab. Sail out to Tiran Island in the crystal clear waters of the Gulf of Aqaba. This site has depths of over 1000 meters and offers beautifully colored coral and rich marine life. Overnight in Sharm. Transfer to Sharm airport for flight to Cairo. Check in at your hotel. Overnight in Cairo. Transfer to Cairo International Airport for departure.